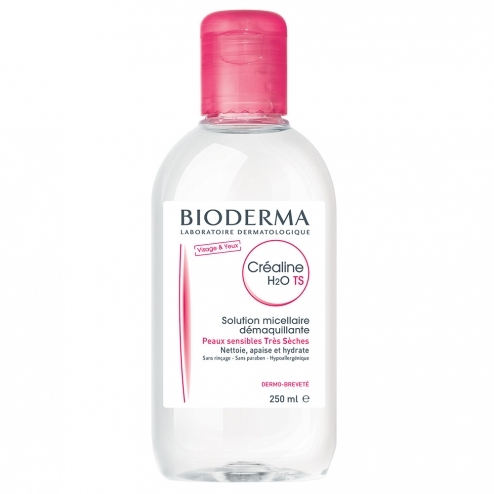 Micellar solution for very dry sensitive skin. Specially formulated for very dry sensitive skin, the Créaline TS H2O micellar solution guarantees a gentle cleansing of the face and eyes (eliminates water-resistant makeup). The micelles contained in its formula allow an elimination of impurities while respecting the cutaneous equilibrium (without soap, physiological pH). Enriched with moisturizing and film-forming active ingredients, Créaline TS H2O fights skin dehydration. Soothing and decongestant active ingredients prevent irritations often associated with cleansing. The patented natural complex D.A.F increases the tolerance threshold of the most sensitive skins. Excellent cutaneous and ocular tolerance (tested under ophthalmic control). Soak cotton with CREALINE TS H2O micellar solution without scent and clean your face and eyes. Renew the application until the cotton is clean. Can be used without rinsing, but requires the skin to be dried later. Delicately dab your face with a towel. INCI formula: Water, PEG-6 caprylic / capric glycerides, glycerin, polysorbate 20, PEG-40 hydrogenated castor oil, ammonium lactate, plantago major leaf extract, fructooligosaccharides, mannitol, xylitol, rhamnose, fructooligosaccharides, propylene glycol, disodium edta, cetrimonium bromide.